Vera Belle Haskins, daughter of Henry and Mayme ((Randall) Alix was born Feb. 3, 1934 in Cornell, Wisconsin. Vera attended Augusta schools and furthered her education with nursing assistant courses at CVTC in Eau Claire. 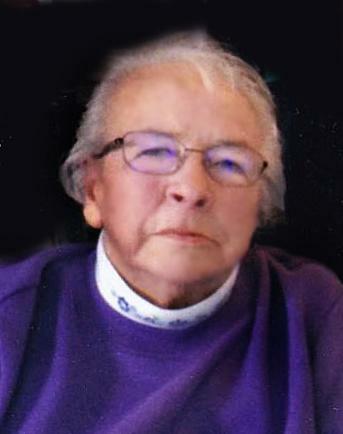 She was employed as a nurse’s aid at the Osseo Area Hospital for over 30 years. Vera was united in marriage to Maurice Haskins on April 5, 1952, and resided at the Haskins family farm in rural Osseo where they raised their 6 children. Vera is survived by her 6 children, Iris (Rod) Teigen and Jeri (Norman) Zempel all of Augusta, James Haskins, Rebecca (Duke) Lee, Kristi (Steve) Chowanec, and Tamara (Richard) Haas all of Osseo; son-in-law, Michael Polinske of Osseo; brothers, Joseph (Phyllis) Alix of Stanley, Daniel Alix of Eau Claire; 10 grandchildren, John and Julie Teigen, Jennifer Sanford, Tom Zempel, Jamie Barone, Andy and Alex Chowance, Anthony and Ashley Haas, Dexter Hanson; 7 great grandchildren, Shanna Teigen, Shelby Pettis, Natalie and Melanie Andersen, Isabella and Emma Barone, Ophelia Zempel. Vera was preceded in death by her parents, Mayme and Henry Alix; husband Maurice on Dec. 6, 2011; sister Shirley Hennaman;and brother Richard Alix. Vera enjoyed spending her time with her family, reading, watching Days of Our Lives, and caring for her many cats over the years. Vera’s loving compassion for others, sense of humor,strong will, and quick wit will be greatly missed by everyone that knew her. A private family services will be held at a later date.